Sword Art Online (SAO) is a popular anime series that aired in 2012. One of the main characters of the series is Asuna Yuuki. She uses a type of sword that is called a rapier and her skills with that earned her the nickname The Flash. 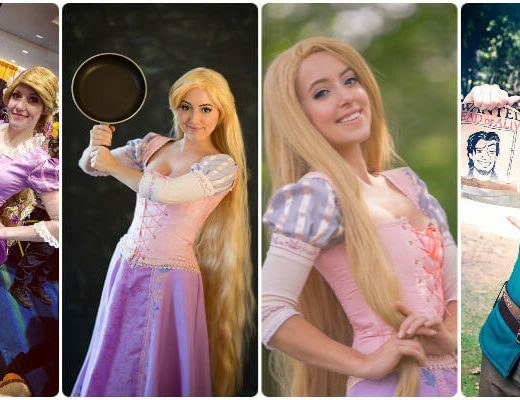 As one of the main characters of the series, a lot of ladies choose her as the anime character they want to cosplay. Cosplaying Asuna, though, entails a lot of decisions, as she has different avatars. In SAO, her popular avatar wore the red and white Knights of the Blood (KOB) uniform with rapier sword. When the series shifted to the ALfheim Online (ALO) arc, Asuna has the Fairy Queen avatar called Titania, which has a white top that has a red ribbon that went around the top part and a long white skirt. Her other avatar in ALO is the Undine avatar, which has a light blue hair and a uniform that is a bit similar in design to the KOB uniform she wore on SAO, except this one’s blue and white. In the SAO Ordinal Scale movie, Asuna’s avatar wears the augma uniform, which is a white uniform with black sleeves and black stripe on the center, red belt, and red pants. 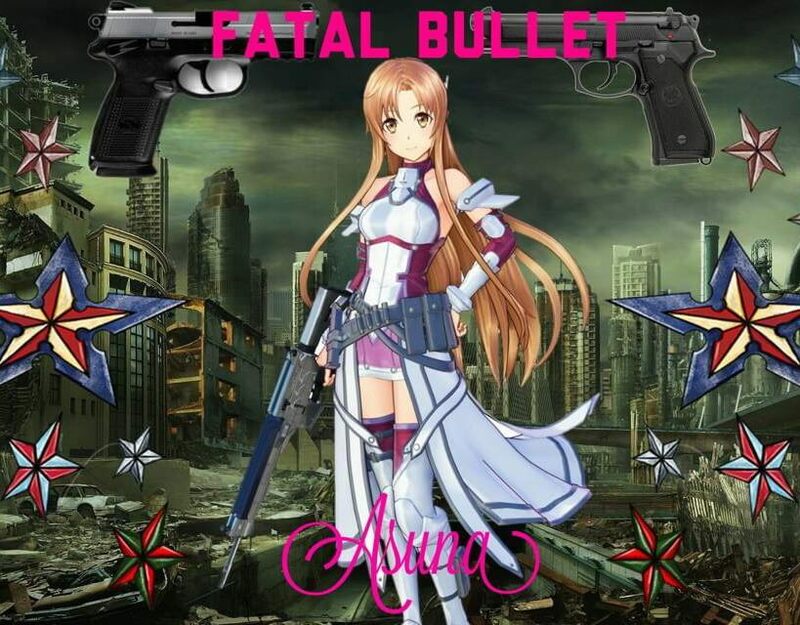 In the SAO Fatal Bullet game, Asuna’s avatar is similar to that of her KOB uniform, except the color of the uniform is white and purple and she’s carrying a gun instead of a sword. Would you like to cosplay Asuna on your Halloween party? Let’s show you the detailed guide one by one. Asuna Yuuki had a lot of different avatars in the Sword Art Online series, but one of the most popular is the one where she is wearing the Knights of the Blood uniform. It’s like a coat that is white with red linings and a red skirt, coupled with white boots. 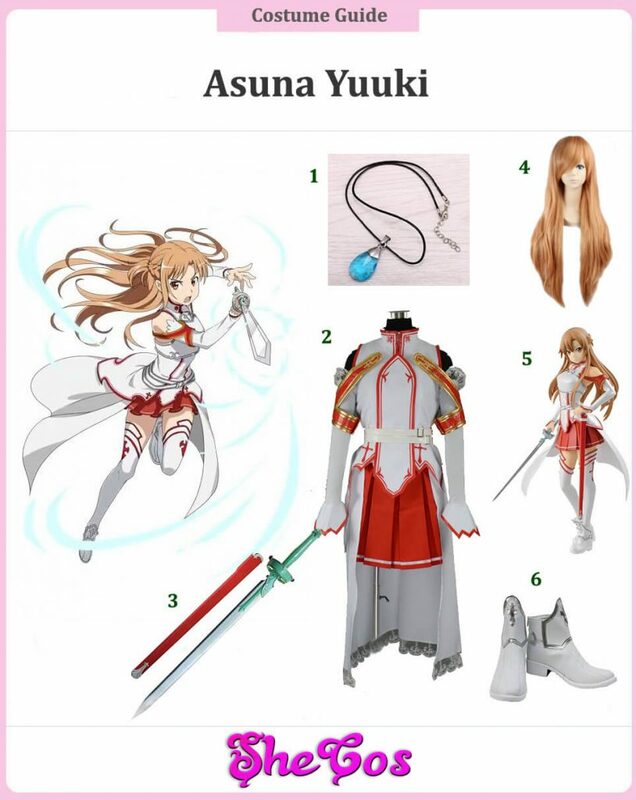 This costume will be paired with a long orange-brownish chestnut wig for Asuna’s hair and will come with two accessories, the heart blue crystal necklace and the rapier sword with red scabbard. You will also get an Asuna Yuuki figure that’s wearing the Knights of the Blood uniform. 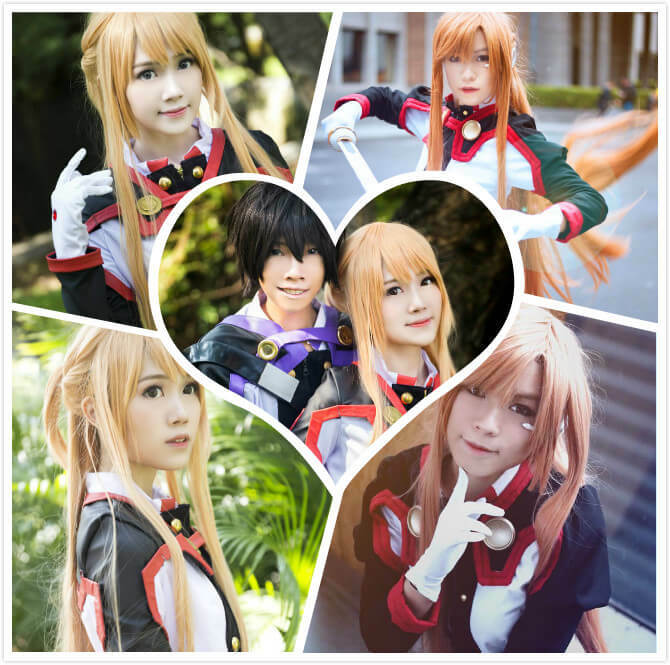 When it comes to cosplaying for female anime characters, Asuna Yuuki of the Sword Art Online anime is probably one of the favorite characters that people try to imitate for their costume, especially her Knights of the Blood avatar. The Knights of the Blood guild is a clearing group in the anime and Asuna is the second in command. Though the character is just the second in command, she actually acted more as the leader of the entire guild during her time there, which adds to the costume’s popularity, as it symbolizes Asuna’s leadership and combat skill. The red and white motif and Red Cross symbol of the Knights of the Blood was motivated by the Knights Templar. It’s so sweating to cosplay with your Kirito for couple cosplay. 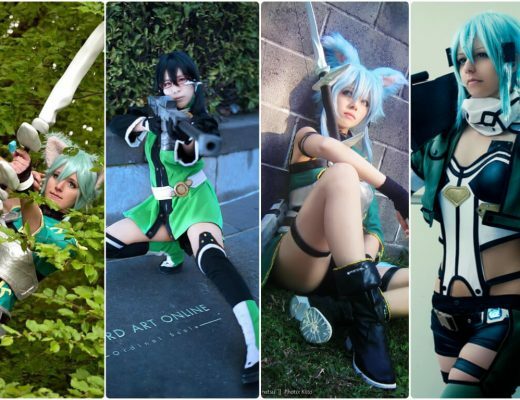 Please feel free to contact us to share your cosplay photo if you have any Asuna cosplay. 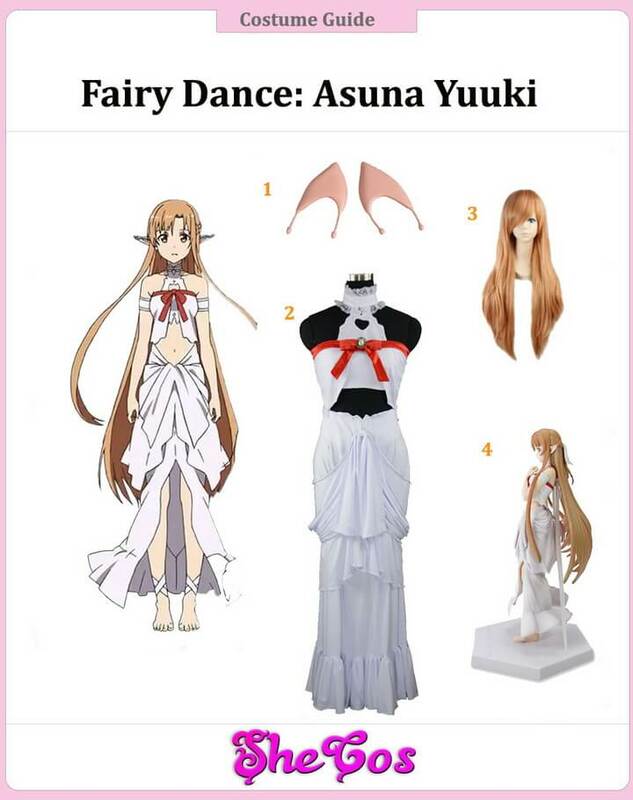 One of Asuna Yuuki’s avatar that you can cosplay is her Fairy Queen or Fairy Dance avatar called Titania that she wore in the ALfheim Online arc. It’s a white halter crop top that has a red ribbon around the top area of the outfit that came together to form a bow and a long white skirt. This avatar is barefoot and only wears white strips around both ankles. The accessories to be worn here are the elf ears and the long orange-brownish chestnut wig for Asuna’s long hair. This Fairy Dance outfit also comes with an Asuna Yuuki figure that is also wearing the Fairy Dance avatar. The ALfheim Online (ALO) arc happened a year after the Sword Art Online (SAO) game was finally completed. Asuna Yuuki was one of the unfortunate characters, who was transferred instantly to ALO after the SAO game ended. She was a prisoner in this Fairy Dance arc series before being rescued by the other main character of the anime series Kirigaya “Kirito” Kazuto. Asuna’s avatar in the Fairy Dance Arc is the Fairy Queen Titania. This is the anime character’s only avatar that is not geared towards combat, as she was mostly a prisoner in this arc and not really one of the combatants. 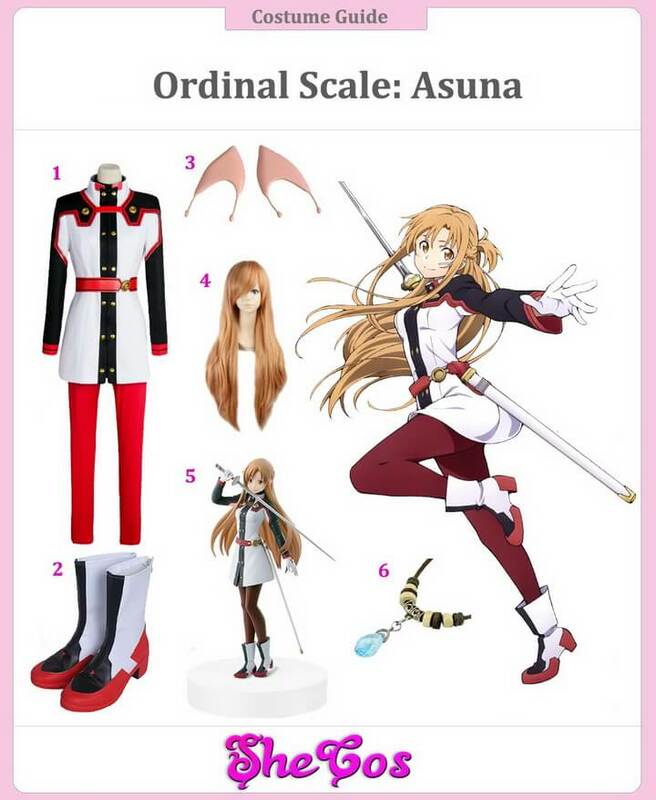 One of the many avatars that Asuna Yuuki wore in the Sword Art Online series is the Augma uniform she wore in the movie Sword Art Online: Ordinal Scale. The uniform is basically a white military top with a thick black stripe in the middle, black sleeves with red linings on the wrist and a red belt. There’s also red tight pants and a white, black, and red boots that are up to above them. It also comes with elf ears a light blue weapon necklace and an Asuna Yuuki figure that is wearing the Augma costume. The popularity of the Sword Art Online (SAO) anime series has reached cinemas with the Sword Art Online: Ordinal Scale movie. Ordinal Scale is an augmented reality game, which means the game takes place in the real world. Asuna Yuuki was one of the first players of the game and she experienced success in the early parts of the game, even defeating several bosses. But the game is causing her to lose her SAO memories, forcing her to stop playing for a while, returning only in the end to help defeat the main boss. Asuna’s avatar in the Ordinal Scale is her only appearance where she’s wearing pants instead of the usual white coat, which is a good and easier alternative to cosplaying the character. 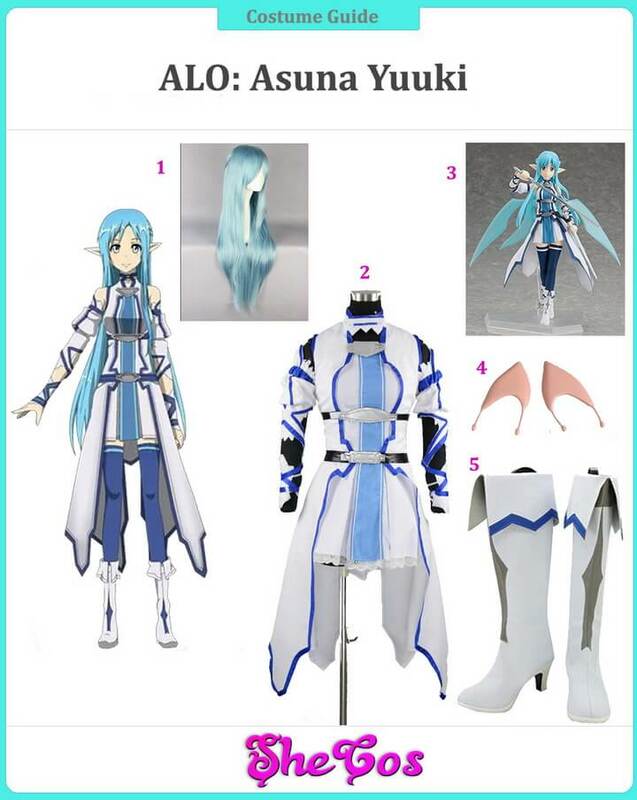 Another avatar of Asuna Yuuki that you can cosplay in the ALfheim Online arc is her Undine avatar. Her outfit here is a bit similar, in design, to her Knights of the Blood outfit in that it’s like a white coat with blue linings, a white skirt, and a white boots with a blue and grey design. This cosplay comes with a long light blue wig, as Asuna is sporting light blue hair in this avatar, and elf ears. It also comes with an Asuna Yuuki figure that’s also wearing the Undine avatar. For the ALfheim Online arc, Asuna Yuuki’s Fairy Queen is not your only choice of appearance that you can cosplay. She also has the Undine avatar, which is the avatar she uses for battle. Her Undine avatar is supposed to be a healer, but Asuna’s style of rushing into battle with her rapier instead of staying in the background and focus on healing gave her the nickname the Berserk Healer. Unlike her Fairy Queen avatar, where she is dressed like a queen, this avatar is similar in design and appearance to her Knights of the Blood avatar, except this one is blue instead of red. If any of Asuna Yuuki’s avatar in the anime series doesn’t seem to interest you but you still want to cosplay her, then you can try her avatar in the Sword Art Online: Fatal Bullet game. The outfit here is similar in design to the Knights of the Blood and Undine outfits, as she wears a white coat that has a purple design on the side and a silver breastplate. You will also be wearing boots that are up to the knees, a long orange-brownish chestnut wig and a Sword Art Online Sword Necklace. 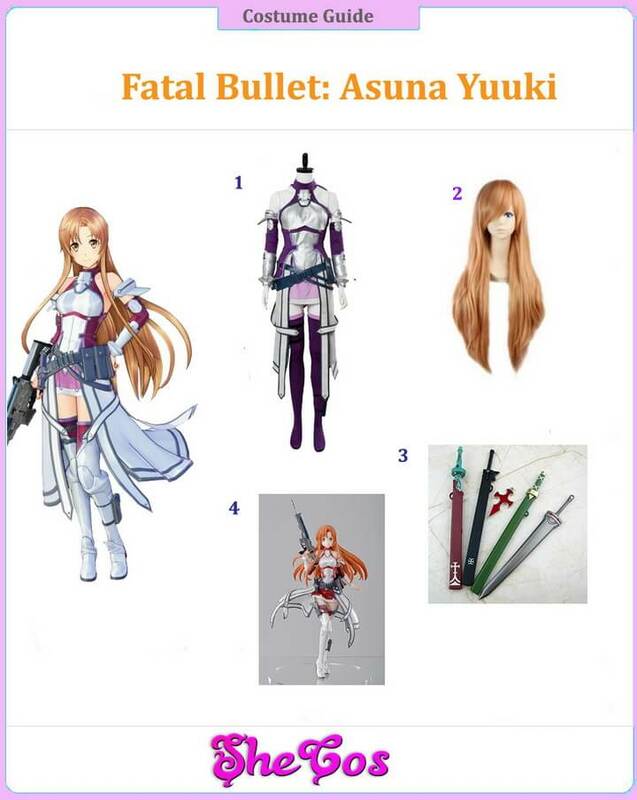 This cosplay also comes with an Asuna Yuuki figure wearing the Fatal Bullet avatar. The Sword Art Online (SAO) series also has a video game titled Sword Art Online: Fatal Bullet. It’s a third-person shooter role-playing game released for PlayStation 4, Xbox One and PC. In this game, you won’t be playing any of the characters of Sword Art Online, as you’ll be playing a character of your own design. You will just be encountering the other characters throughout the game, including one of SAO’s main character Asuna Yuuki. Asuna’s avatar in this game is a bit similar to the Undine avatar and Knights of the Blood avatar, as she’s also wearing a white coat here. The main difference, though, is her weapon, as the female warrior is carrying guns instead of her signature rapier.